1 April 2012. 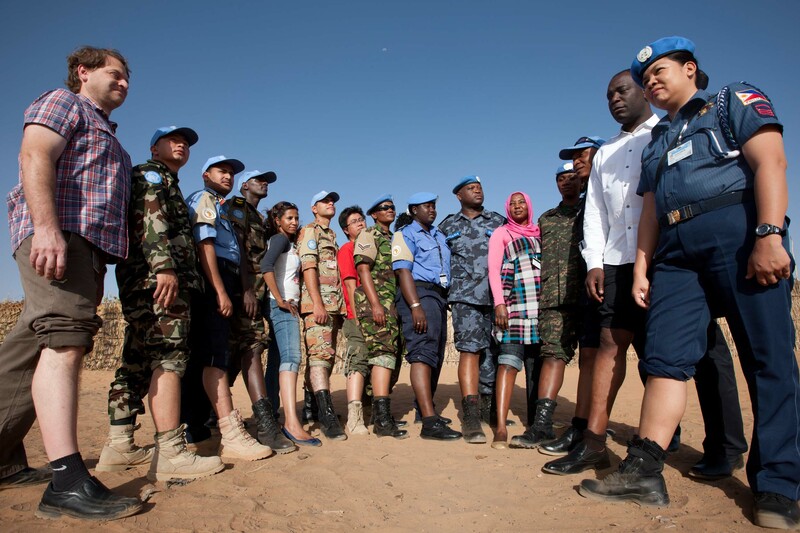 El Fasher: 15 Members of UNAMID (five civilians, five police advisors and five military) pose in Abu Shouk village (North Darfur) for the “Lend your leg” campaign organized by UN to commemorate the International Day of Mine Awareness and Assistance in Mine Action (4 April). The Landmine and Cluster Munition Blog is an unofficial platform to encourage discussion and information sharing among individuals and organizations involved in the following thematic areas related to landmines and cluster munitions: Ban Policy, Funding, Mine Action, and Victim Assistance. This is a moderated blog. We aim for lively engaging posts on the above themes. As such post contributions will be edited for style and relevance while welcoming a wide variety of viewpoints. The blog is aimed at policy advocates, activists, researchers and anyone curious about or involved in issues relating to landmines and cluster munitions. It is intended to promote creative thinking and exchange of ideas and perspectives. The blog is not intended to be a formal channel for presenting research, or a venue for institutional communications. Therefore, it is not a place for press releases or announcements, or to invite people to events, for example. The ICBL-CMC Communications team manages the blog. Draft blogs should be submitted to: media@icblcmc.org , for review, editing as needed and posting. A key function of the blog is the ability for readers to comment on posts. These comments can be anonymous or signed. They are moderated, which means they are accepted or rejected (e.g. if they contain offensive words, or are spam messages). Another key function is the ability to search the blog. We have assigned various labels to each of the blog posts, allowing users to locate specific themes quickly. The Blog Guidelines are featured prominently on the column to the left of the Front Page to inform readers how they can contribute to the blog. Also included in the left column is a Community forum to highlight users who have contributed as well as those who are following the blog or who interact with the blog through their comments. The option to follow the blog is in the left column to encourage readers to subscribe via email. The Front Page of the blog offers a slider feature where posts will be highlighted to direct readers to interesting topics. The slider will be updated periodically to encourage readers to explore various posts located on the blog. The column on the right offers a Tag Cloud where users can search by topic, while another cloud features what topics are currently being discussed. Additional Resources in the right column offers links and websites of organisations of interest. YouTube Links are offered for readers to highlight videos that may also be of interest. The blog seeks to provide a platform for discussing work around landmines, cluster munitions, the Mine Ban Treaty and the Convention on Cluster Munitions, from different perspectives. We welcome contributions from the four thematic areas listed above. The key criteria are that the posts be concise, thought provoking and interesting – and even entertaining. We look forward to seeing contributions from researchers, advocates, and others interested in the mine ban treaty, the convention on cluster munitions and related issues. First, come up with something you want to communicate like an idea, an event or a finding. Keep it simple and not fancy, and as a rule we recommend spending no more than an hour writing it. Remember, the blog should be concise – no more than about one A4 page in 12-point font as a rule. Try to be economical in your writing. Too many long words and sentences and people lose interest in reading. Contributors are encouraged to submit posts in Microsoft Word and can include hyperlinks where necessary. Hyperlinks should be named appropriately. Photos should not be embedded in the document and should be submitted separately to allow the blog administrator to format as necessary. To accommodate our diverse audience, please keep in mind to use language that can be understood easily by the international community with different language capabilities (ex. Non-mother tongue English speakers). “Clean” submissions are appreciated, i.e. do check spelling and functionality of links before submitting your post (for your sake and ours). All draft blog posts and related media should be e-mailed to us: we do not re-key hard copy or scan pictures. A careful choice of picture can really enhance a post, and we would appreciate it if you would provide us an image to go with it. We do not use copyrighted material (unless you own it and are permitting us to use the material without charge), but there is plenty of free material out there on the Internet (and probably even in your own photo library). Flickr is also a good source of images – check the copyright indications. We always give picture credits and a link if available, so you need to include that information at the foot of your post. We also encourage links to other websites of interest, which we can embed within the text of your blog. Please provide the URL for links in your draft document and we will hyperlink with the appropriate words in the text. If you want sources added to your post that are not on the web, you can include them as references at the bottom of your draft. YouTube links or links to other video can add to your post and are encouraged. Quotes should not be long and should be used sparingly. Once you have submitted your post, it will be edited for style, format and length but not for content. We encourage lively, concise and interesting posts. We may come back to you on editing points. Please remember to keep your post relevant to the parameters of the blog. After your post text is edited, we will copy it into WordPress in draft mode, format it, add the links you’ve suggested, come up with some labels for search purposes, and add the picture. Finally, when the time is right we hit ‘publish’ and your post will be made public.